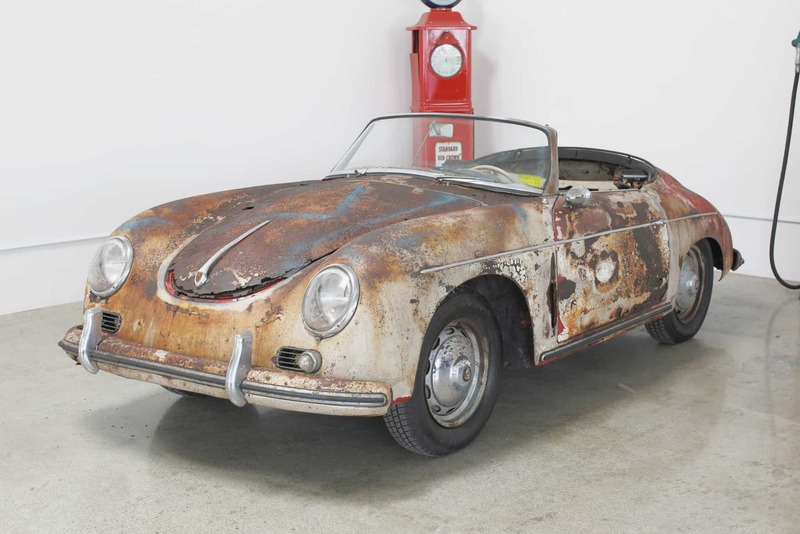 Ultra -rare 1959 Porsche Convertible D Super “barn find” stored since 1972: all original: All numbers-match; excellent factory gaps; all original parts, never disassembled; 110,199 original miles; originally fitted with “central locking wheels” or Rudge wheels. A highly optioned car. No signs of any accidents ever, original bumpers and trim untouched. The original paint has flaked off from age but does not appear to have ever been repainted. Some areas of significant rust, but the original longitudinal appear solid. Doors shut perfectly. All the necessary metal panels are available and in stock at Trevor Hammerworks. Original numbers-matching engine does not turn over, car has not been started since 1972. All numbers have been verified by Porsche, COA is on order. Original color is Ruby Red. Excellent candidate for top-end restoration. We go to extents to document our cars in pictures and provide the most transparent listings on Ebay. Please study the pictures carefully rather than requesting descriptions. Please complete any inspections or ask any questions prior to bidding or committing to buy the car. Thanks for the interest!